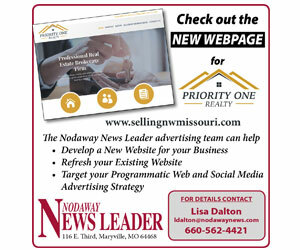 The Nodaway News Leader has compiled a list of those individuals elected to serve in their towns and villages in Nodaway County. Arkoe Mayor: Darrell Cronk Road Commissioner: Steve Conz Chairman: Joe Partridge Clerk: Megan Partridge Treasurer: Joyce Cronk Barnard Mayor: Mike Murphy Council Members: Zeb Coleman, Glenn Miller, Deb Snyder, Ned Waterman Burlington Jct. Maryville Young Players has announced auditions for its upcoming musical theatre production “Alice in Wonderland Jr.” Any student in grades second through ninth interested in performing in MYP’s first show of the 2018 season are invited to audition April 19, 20 or 21 at the fine arts building on the Northwest Missouri State University campus. The filings have closed for candidates running in the August 7 primary and November 6 general election. Those individuals who are running for office are: State Representative for District 1: Allen Andrews, Grant City, Republican; and Paul Taylor, Skidmore, Democrat. Nodaway County Recorder of Deeds: Lisa Nickerson, Maryville, Republican; and Sandra “Sandy” Smail, Maryville, Democrat.